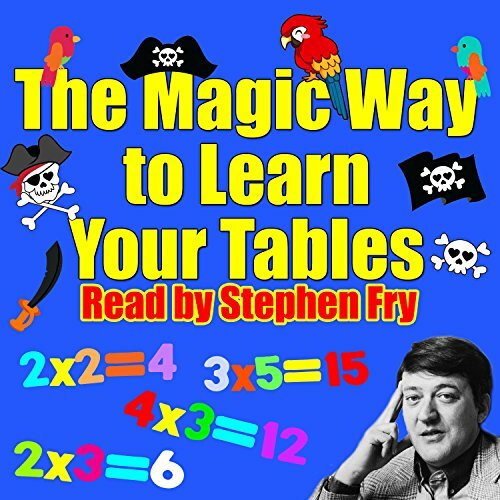 You just found the magic way to learn your times tables! Enjoy five incredible stories narrated by the brilliant Stephen Fry, featuring Chris Emmett and Mark Angus. These vocal performances will have your child effortlessly learning their times tables and laughing their heads off at the same time. It's the Pirate, the Parrot & the Genie! Stephen Fry is a comedian, an actor, a writer, and a presenter. His acting roles include a Golden Globe Award-nominated lead performance in the film Wilde, Melchett in the Blackadder, a recurring role on the crime series Bones, and Gordon Deitrich in V for Vendetta, among others. He has also written and presented numerous documentaries and was also the longtime host of the BBC television series QI. This is the 'original' audio from the cassette/CD, there are lots of references to &amp;quot;the cards in your cassette case&amp;quot; and other materials. There seems to be no option to download and print these for use with the digital download. Not having the additional materials (or in this case, an option to download and print them) makes the audio much less useful in the teaching of times tables. Disappointing, I feel this teaching tool is incomplete without the option to print the cards. Unfortunately the book referes to cards which you can’t access and can’t print. Therefore the book is completely pointless.